Choosing the Top Things To Do In Yellowstone Park is not an easy things to do as there are so many world-renowned attractions, activities and destinations in Yellowstone National Park. But after spending over 4 decades exploring and enjoying the world's first national park, we have narrowed our list down to the following Top Things To Do In Yellowstone Park. While compiling this list, we chose our audience to be the typical Yellowstone National Park vacationer who has come to Yellowstone Park to see the main attractions along the Grand Loop. The order in which we will present our Top Things To Do In Yellowstone Park are based on their locations along the Grand Loop, where we will start from the top of the loop at the North Entrance at Gardiner Montana, and go clockwise around it. So here it is... our list of the Top Things To Do In Yellowstone Park. 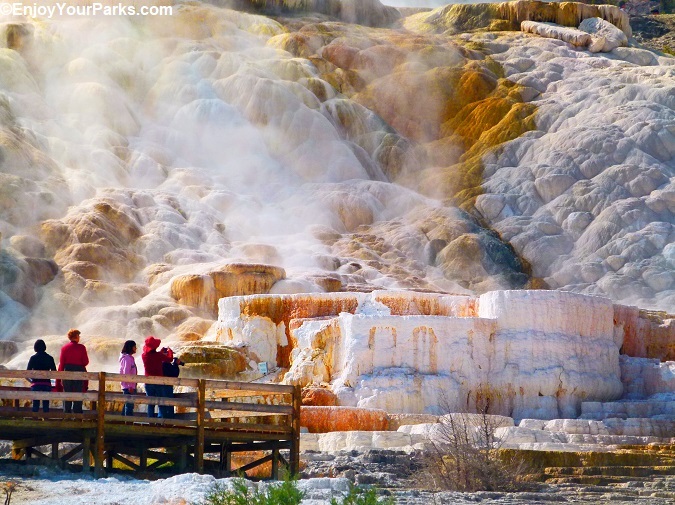 Mammoth Hot Springs is one of the Top Things To Do In Yellowstone Park. Located just 3.8 miles south of the North Entrance of Yellowstone National Park, Mammoth Hot Springs is the first attraction on our Top Things To Do In Yellowstone Park. Remember, we are basing the order of these attractions as to their location along the Grand Loop, starting at the North Entrance at Gardiner Montana. The main attraction at Mammoth Hot Springs in Yellowstone National Park is the Mammoth Hot Spring Terraces, which are a vast series of geyser terraces that are constantly changing. As the mineral deposits from geyser water build these giant terraces, the "plumbing" is in constant flux. This means where there was once active geyser activity with wet and colorful terraces, the water seems to "dry up" and move to another spot, creating another area of stunning beauty, leaving the other to become dry and grey. It's all a natural process and has nothing to do with lack of water. With that being said, there are several boardwalks that take you to "where the action is", meaning the paths will lead you to where the active hot springs are throughout these massive terraces. Other attractions at Mammoth Hot Springs besides the terraces are the wildlife, namely the elk herd that loves to hang out inside the town of Mammoth Hot Springs. During the spring of the year, the cow elk even deliver their calves right inside the town. Why? they’ve learned to somewhat avoid wolves by doing so. During the fall of the year, especially the last two weeks of September and into October, the elk rut is in full force, and you can actually watch bulls fighting for a harem right inside the town of Mammoth Hot Springs! It’s quite a show to say the least. Just south of Mammoth Hot Springs is Swan Lake Flat. Swan Lake Flat is not only extremely scenic, but is renowned for it’s wildlife viewing. More specifically, because elk calve here, grizzly bears are frequently seen in this open sage brush, as well as wolves. There are also buffalo (bison) found in this broad, open area known as Swan Lake Flat, outlined with towering mountains to the west, and is really an amazing place to check out while exploring the Mammoth Hot Spring Area... and you even get to drive through a really amazing geologic feature known as the Golden Gate of Yellowstone Park... and just before that is the Silver Gate of Yellowstone Park! Mammoth Hot Springs is the first attraction on your clockwise tour of the Grand Loop Road, and is among our top things to do in Yellowstone National Park. Tower Junction, which includes Roosevelt Lodge and Tower Fall, is one of the Top Things To Do In Yellowstone Park. Tower Junction (Tower Fall / Roosevelt Lodge) is our next on our list of Top Things To Do In Yellowstone Park, and is located about 23.5 miles east of Mammoth Hot Springs along the Grand Loop Road. The drive between these two points of interest is not only beautiful, but is also known for outstanding wildlife viewing. Wolves, grizzly bears, coyotes, foxes, moose, black bear, elk, great grey owls, bison (buffalo), hawks, eagles and much more can be seen along this wonderful road. Of course you don’t always see these animals, and sometimes you won’t see any... but if you spend any time on this section of the Grand Loop Road between Gardiner Montana and Tower Junction, you’ll get an eye full. The landscape is remarkable as well, with its rolling hills, Douglas Fir forests, sage brush and broad valleys. 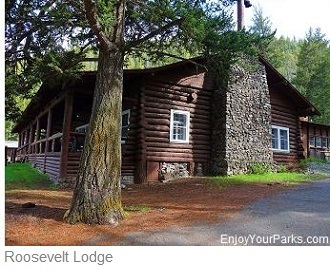 Located at Tower Junction is the historic Roosevelt Lodge and Cabins. Named after Teddy Roosevelt, who loved this area of the park and spent a lot of time here, the Roosevelt Lodge and Cabins were built in the early 1920s, and are a great place to explore. 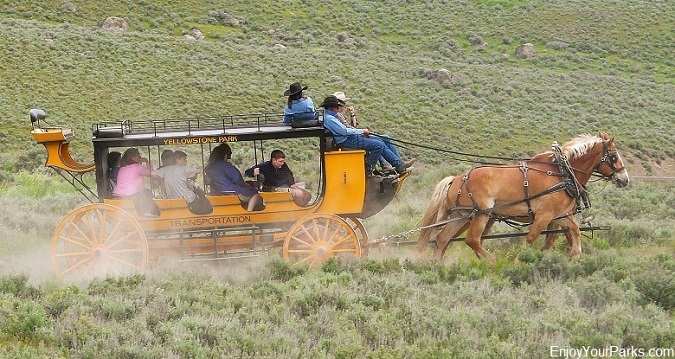 A popular thing to do here is to take a wagon train that takes visitors on an authentic cowboy cookout about a mile down a gorgeous valley. Just up the road from Tower Junction along the Grand Loop Road (stay right), is the Tower Fall Area. This drive is fantastic as the road winds up into an interesting geological area where basalt lava beds are hundreds of feet thick, and where the Yellowstone River cuts through these beds, creating a narrow canyon that will take your breath away. Along the road and along the other side of this steep canyon you will see columns of basalt rock known as “columnar jointing”. These eight sided columns formed where the basalt lava cooled at just the right temperature. It’s really quite spectacular. Once you reach Tower, there is the Tower Visitor Center, where you can take a short walk to view the famous Tower Fall. 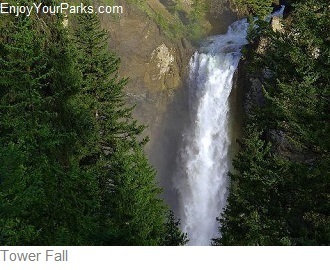 Yes, they are called “Tower Fall”, not “Tower Falls” for some reason. This waterfall is remarkable and very much worth the short walk down a paved path. The Tower Campground is also located here, which is a popular place for campers. So as you drive along the Grand Loop in Yellowstone National Park, make sure to explore the Tower Junction area, including Roosevelt Lodge and Tower Fall. This popular Yellowstone Park area is definitely on our list of Top Things To Do In Yellowstone Park. 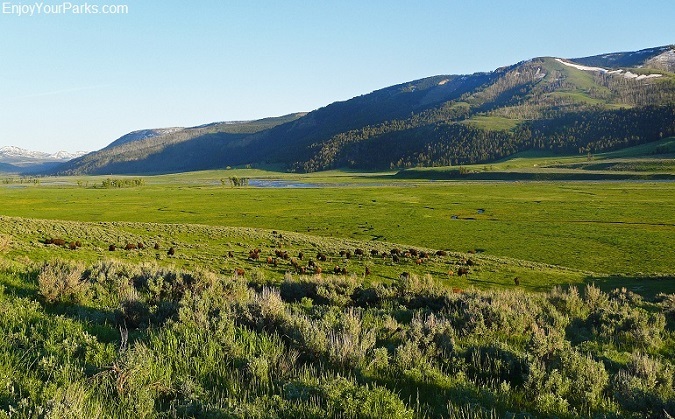 The Lamar Valley is one of our Top Things To Do In Yellowstone Park. The Lamar Valley in Yellowstone National Park is without question among our Top Things To Do In Yellowstone Park. To get to the Lamar Valley, instead of heading for Tower Fall at Tower Junction, take a left instead. This road is U.S. Highway 212, and it will take you directly through the world famous Lamar Valley as it then works its way up Soda Butte Creek Valley and onto the Northeast Entrance of Yellowstone National Park near Silver Gate and Cooke City Montana. Known as the American Serengeti, the Lamar Valley of Yellowstone National Park is world famous for its wildlife viewing opportunities. This broad, beautiful valley is home to countless species of animals such as antelope, wolves, grizzly bears, black bears, eagles, bighorn sheep, buffalo (bison), elk, river otters,coyotes, foxes and much much more. The road stays above and to the north of the Yellowstone River as it meanders through the broad Lamar Valley, and there are several outstanding pullouts that provide wonderful views of both animals and landscapes. One of the reasons the Lamar Valley offers such amazing wildlife viewing is that it receives the least amount of seasonal snow in the entire park, so it is a popular place for animals to winter there, or at least hang out there until moving on to even lower valleys with less snow. And during the spring, elk and bison love to give birth to their calves here due to the lush vegetation, easy terrain to navigate and easily accessible water. This is why you will more than likely see wolves and grizzly bears in the Lamar Valley... as they see these calves as food. And because bison (buffalo) winter in the Lamar Valley, the wolves and grizzly bears hang out here in the early spring to look for animals that did not survive the winter. But even though the Lamar Valley is world famous for its wildlife viewing, its such a broad valley that animals can be a fair distance from the road. Therefore, ALWAYS bring binoculars and/or a spotting scope so you can enjoy watching these animals “do their thing”, even if they are a far distance off the road. And guest what? This road, meaning the road between Gardiner Montana and Cooke City Montana is OPEN ALL YEAR ROUND TO WHEELED VEHICLES! So you can enjoy this magical place 12 months a year. And keep in mind that the road between Tower Junction and the Northeast Entrance of Yellowstone Park is great wildlife viewing the whole way, even though the actual Lamar Valley is in the middle third of this road. The first third of U.S. 212 beyond Tower Junction takes you along a gorgeous drive that is also teaming with wildlife. The road will initially take you over the Yellowstone River near the Yellowstone River Picnic Area, where bighorn sheep love to hang out. Then, after driving through an open valley with wonderful scenery and a lot of wildlife viewing opportunities, the road will then once again cross the Yellowstone River, and just beyond a narrow section, you will then enter the broad Lamar Valley. You will eventually reach the confluence of Soda Butte Creek, where the road then leaves the Lamar Valley and begins following Soda Butte Creek northward toward the Northeast Entrance of Yellowstone Park and Cooke City Montana. This drive along Soda Butte Creek is also a remarkable wildlife viewing mecca, and as you reach the towering mountains of the northeast section of Yellowstone Park, you’ll be amazed at their towering beauty. This section of the park, which includes the Pebble Creek Area, is some of the most mountainous and scenic places in Yellowstone. The bottom line is this: If you like to see wildlife, you will LOVE the road between Tower Junction and the Northeast Section of Yellowstone National Park, which includes the Lamar Valley of the Yellowstone. The Lamar Valley and the road that takes you there and beyond, is without question among the very top things to do in Yellowstone Park. 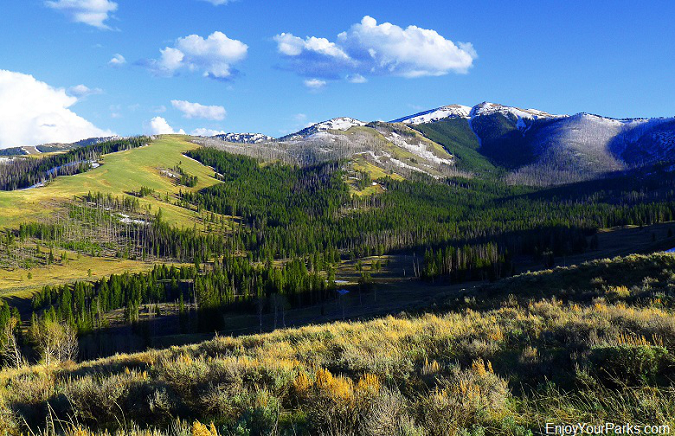 Mount Washburn and Dunraven Pass is one of the Top Things To Do In Yellowstone Park. The Mount Washburn Area, which includes Dunraven Pass, is another attraction on our top things to do in Yellowstone Park. Located along the Grand Loop, Mount Washburn (elevation 10,243 feet) rests between Tower Junction and Canyon Junction, and is truly a “whole new world”. This section of the Grand Loop Road in Yellowstone Park takes you up and over Dunraven Pass (8,859 feet) through a series of switchbacks... and the view just gets better and better as you climb in elevation. Near the top of Dunraven Pass, there are two trailheads (one on each side) that takes hikers up to the summit of Mount Washburn. The trailhead on the north side of Dunraven Pass is the Chittenden Road Trailhead, and the south side is the Dunraven Trailhead. Both are 2.5 miles in length (one way), with both being about 1,500 feet in vertical elevation gain. Once you reach the summit, you’ll be greeted by the Mount Washburn Fire Lookout, where you can actually take stairs up to an observation deck... which provides some of the most stunning views found anywhere in Yellowstone. You can practically see “forever”, and you’ll be extremely glad you took the time and effort to hike to the summit of Mount Washburn. One of the bonuses that you’ll enjoy in the Mount Washburn / Dunraven Pass Area is that there is plenty of wildlife in the area... including grizzly bears and a resident herd of bighorn sheep. In addition to wildlife, if your timing is right, the wildflowers are outrageous in the Mount Washburn / Dunraven Pass Area... so much so that you’ll burn an entire memory card taking photos of this beautiful scenery. Because Dunraven Pass in Yellowstone National Park is so high (8,859 feet above sea level), the weather is definitely an issue. TONS of snow falls on the Dunraven Pass Area each winter, and this deep snow takes a very long time to melt off during the early summer. Because of all this snow, Dunraven Pass is the first section of the Grand Loop Road that closes in the fall, and last section of the Grand Loop Road that opens in the spring. Hopefully you’ll be visiting Yellowstone National Park when Dunraven Pass is open, and you’ll then understand exactly why the Mount Washburn / Dunraven Pass Area is among our list of top things to do in Yellowstone Park. 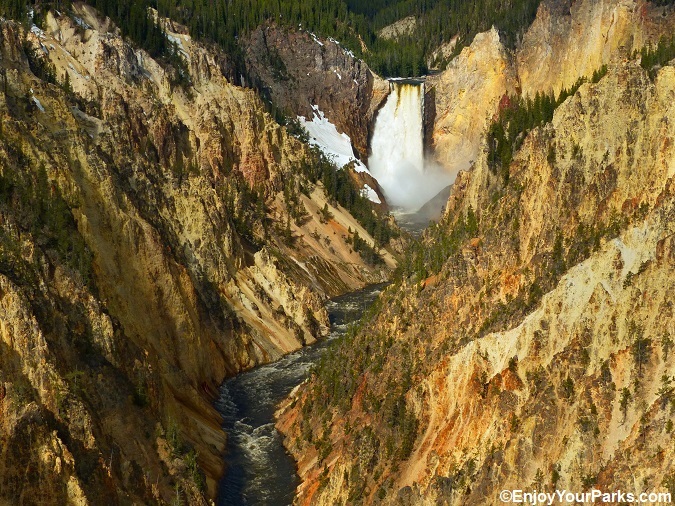 The Grand Canyon of the Yellowstone River is one of the Top Things To Do In Yellowstone Park. 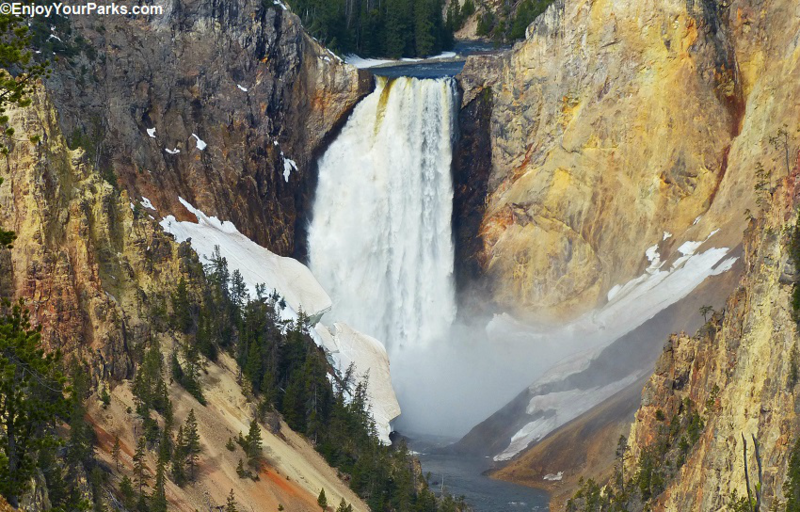 The Grand Canyon of the Yellowstone River, located at what is known as the “Canyon Area”, is one of the most iconic attractions in Yellowstone National Park, and is very high on our list of top things to do in Yellowstone Park. The “Canyon Area” includes not only the Grand Canyon of the Yellowstone River, but also Canyon Village, which is home to an outstanding Canyon Visitor Center, shops, restaurants, a motel, cabins and a the Canyon Campground. The Grand Canyon of the Yellowstone River was formed when this section of Yellowstone Park, which is composed of thousands of feet of Basalt Lava Rock layers, uplifted millions of years ago. Once this happened, gravity did its thing as the Yellowstone River then began to cut its way through these massive layers of volcanic rock, resulting in the 1,200 feet deep and 4,000 feet wide Grand Canyon of the Yellowstone River. And the bonus is the color of this basalt lava rock ranges from yellows to oranges to reds... which makes for a sight that is beyond description. There are two separate roads available to view the Grand Canyon of the Yellowstone, which is the North Rim Road of the Grand Canyon of the Yellowstone River, and of course a South Rim Road. Both rim road are paved as they take you to various overlooks and trails... one even taking you to an overlook that is almost at the bottom of the Grand Canyon of the Yellowstone River, which is Uncle Tom’s Trail. Another trail will take you to the brink of the amazing Lower Falls of the Yellowstone River, which you literally look directly over this massive 308 feet high waterfall. Above the world famous Lower Falls of the Yellowstone River, you’ll find a great overlook of the Upper Falls along the South Rim of the Grand Canyon of the Yellowstone River. The Upper Falls are 108 feet high as compared to the massive Lower Falls, which at 308 feet, is higher than Niagara Falls. Even though Upper Falls of the Yellowstone River is not as impressive, these falls are still remarkable. Of all the overlooks along the North Rim and South Rim of the Grand Canyon of the Yellowstone River, the most famous is Artist Point along the South Rim. Artist Point gives visitors a spectacular view of not only the Grand Canyon of the Yellowstone River, but also of the iconic 308 foot high Lower Falls of the Yellowstone River. This view from Artist Point is as iconic as Old Faithful Geyser, so bring plenty of memory cards during your drive along the Grand Canyon of the Yellowstone River. The Canyon Area soars as one of our very top things to do in Yellowstone Park, and once you experience and explore the Grand Canyon of the Yellowstone River, you’ll completely understand why. 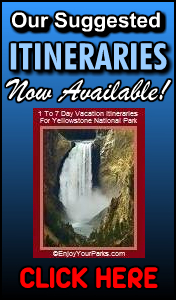 It will be one of the highlights of your Yellowstone National Park vacation. 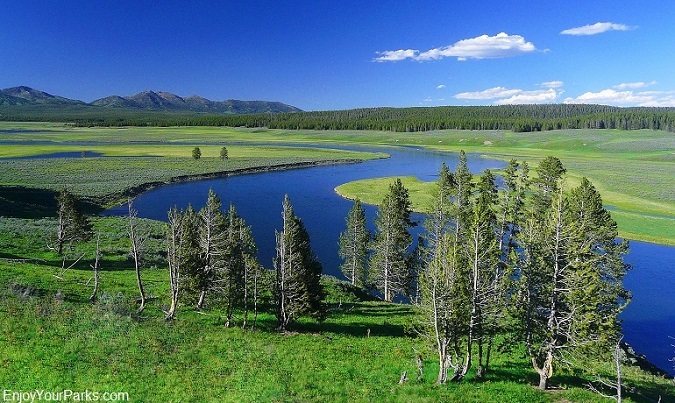 The Hayden Valley is one of the Top Things To Do In Yellowstone Park. Hayden Valley in Yellowstone National Park is located directly between the Grand Canyon of the Yellowstone River, and Yellowstone Lake Area of Yellowstone National Park. Listed on our top things to do in Yellowstone Park, the Hayden Valley is a broad, gorgeous valley where the Yellowstone River meanders through it. This lush valley is home to an incredible variety of wildlife, including a massive buffalo (bison) herd, wolves, grizzly bears, trumpeter swans, river otters, pelicans, eagles and much more. The landscape of Hayden Valley is stunning, and there are some great overlooks and pullouts where you can stop and take in this amazing scenery. To the North you can see Mount Washburn and the surrounding mountains, which further adds to the beauty of Hayden Valley in Yellowstone National Park. Near the south end of Hayden Valley is the Mud Volcano Area of Yellowstone National Park. The geothermal features along the Mud Volcano Boardwalk are very unique and fascinating, and are definitely worth taking the time to explore. Still further to the south of Hayden Valley lies LeHardy Rapids in Yellowstone National Park along the Grand Loop Road, south of the Mud Volcano Area and are definitely an attraction to take some time to explore. The LeHardy Rapids are where cutthroat trout can be seen jumping over the rapids during their spawning season in the spring. Pelicans and other birds hang out here, and during the spring of the year for just a few weeks, Harlequin Ducks can be seen here during their brief mating season. There is a well designed boardwalk that takes you near these fascinating rapids. Hayden Valley is probably best known however for the massive buffalo (bison) herd that calls Hayden Valley home each summer. It’s especially thrilling to watch these buffalo cross the Yellowstone River... It’s probably looks very similar to the Old West Days when the monstrous herds used to “choke” the riverways when they decided to cross them. And speaking of “choking”, be prepared for a few “buffalo jams” when these giant herds decide to cross the Grand Loop Road in Hayden Valley. We’ve been delayed for hours at times! Hayden Valley of Yellowstone National Park easily qualifies as one of our top things to do in Yellowstone Park. Take your time and enjoy the various pullouts and overlooks that are located all along the Grand Loop Road in Hayden Valley... its truly a magical place. 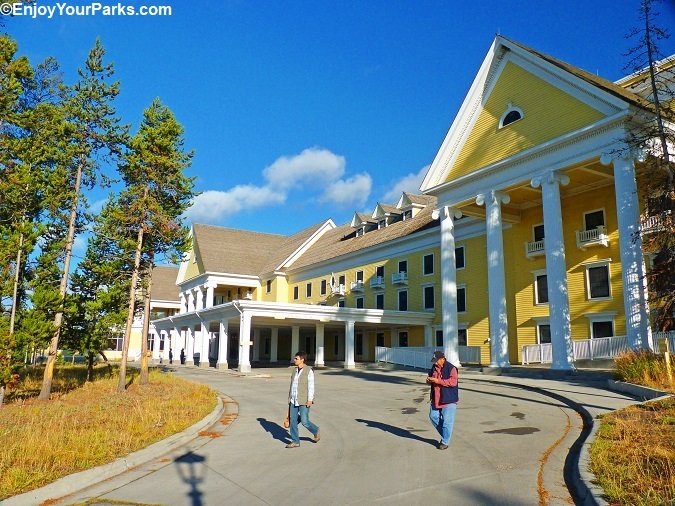 Lake Yellowstone Hotel is one of the Top Things To Do In Yellowstone Park. The next attraction found along the Grand Loop Road in Yellowstone National Park is Yellowstone Lake, which includes Yellowstone Lake Hotel, Yellowstone Lake Lodge, Lake Village, Fishing Bridge and Bay Bridge. South of Hayden Valley, the Yellowstone Lake Area, also known as “Lake”, is yet another entirely different world found in Yellowstone National Park. Yellowstone Lake, which is actually officially known as Lake Yellowstone, at 7,733 feet above sea level, is the largest high altitude lake in the United States. This mammoth lake has a surface area of 136 square miles, and has over 141 miles of shoreline. And not only is Yellowstone Lake big, but it is deep. The deepest section of Yellowstone Lake is 430 feet in depth. And with the high altitude comes with it EXTREMELY COLD WATER TEMPERATURES. Even in the summer the temperature of Yellowstone Lake only reaches 38 degrees at the warmest, and during the winter the ice can reach 3 feet in thickness. And also because of the high altitude, Yellowstone Lake is covered with ice at least 6 months a year, if not longer. Yellowstone Lake in Yellowstone National Park is in the center of the massive Yellowstone Caldera, which is basically the center of the Yellowstone Super Volcano that is regarded as one of the largest active Super Volcanoes on earth. “Active” means that every 100,000 years or so, things act up here... but the chances of it happening in our lifetime... or within the next 5,000 years, is astronomical. In addition to Yellowstone Lake itself, the major attractions of the Yellowstone Lake Area includes the historic Fishing Bridge, the historic Lake Yellowstone Hotel (a.k.a. Lake Hotel, Yellowstone Lake Hotel), historic Yellowstone Lake Lodge, Yellowstone Lake Village and Bridge Bay Marina and Bridge Bay Campground.... all of which deserves your time to explore and enjoy. Lake Yellowstone Hotel (a.k.a. Yellowstone Lake Hotel, Lake Hotel), was built in 1891, and is listed on the National Register of Historic Places. This grand old hotel presently has the decor and ambiance of the late teens and early 1920s, and reminds us of the “Titanic” period. If we could choose one word to describe this historic hotel is CHARMING. Even if you don't stay at the Lake Hotel, you really need to explore it... the Lake Hotel is a remarkable place that you will completely enjoy spending time at. And by the way, the wonderful lobby also has a great gift shop. 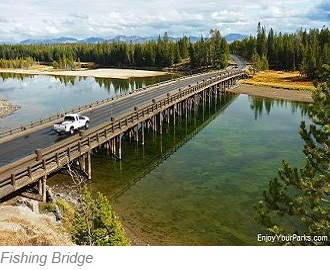 Fishing Bridge is a major Yellowstone Lake Area attraction as it crosses the Yellowstone River just after it leaves Yellowstone Lake on its journey over a thousand miles to the Missouri River in Eastern Montana. Built in 1902, Fishing Bridge used to be where visitors could drop their fishing lines into the Yellowstone River below them and catch Native Yellowstone Cutthroat Trout. Those days are gone and fishing is no longer permitted from Fishing Bridge, but you can still look into the water from the bridge and see these native Yellowstone cutthroat trout swimming in the Yellowstone River below. And just to the south of Fishing Bridge along the road to the East Entrance of Yellowstone National Park at Sylvan Pass, is the wonderful Fishing Bridge General Store, Fishing Bridge Museum and Fishing Bridge Campground. Yellowstone Lake Lodge is yet another attraction listed on the National Register of Historic Places, and is also a “must see” during your Yellowstone National Park vacation while in the Yellowstone Lake Area. Built in 1891, the Yellowstone Lake Lodge, known as “Lake Lodge”, is a wonderful log structure that is home to one of our favorite porches in the world. This fantastic porch looks out onto Yellowstone Lake, and is the greatest place on earth to enjoy a hot cup of coffee in the morning. Some of our fondest memories are relaxing on this magical front porch. The entire lodge is classic “National Park Lodge” architecture, and is one of our favorite Yellowstone Park structures. Bridge Bay is down the road a few miles from Yellowstone Lake Village, and is home to an incredible bay with many gorgeous boats docked in it during the summer months at the Bridge Bay Marina. This marina is also where visitors can rent aluminum motor boats and canoes so they can explore the massive Yellowstone Lake.... but keeping in mind that if they fall into Yellowstone Lake, the survival time is no longer than about 15 minutes! Next to the Bridge Bay Marina is the Bridge Bay Campground, which is an extremely popular place for campers to “pitch their tent”. 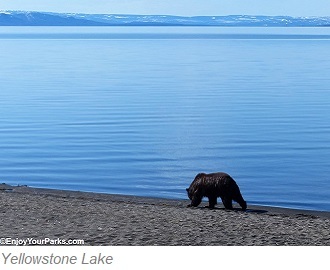 The Yellowstone Lake Area, known as “Lake”, is not only on our list of the top things to do in Yellowstone Park, but is one of our most favorite places on the planet... You’ll see why we feel this way once you explore this amazing Yellowstone National Park top attraction. West Thumb Geyser Basin is one of the Top Things To Do In Yellowstone Park. Another top attraction on our list of the top things to do in Yellowstone Park is West Thumb Geyser Basin. 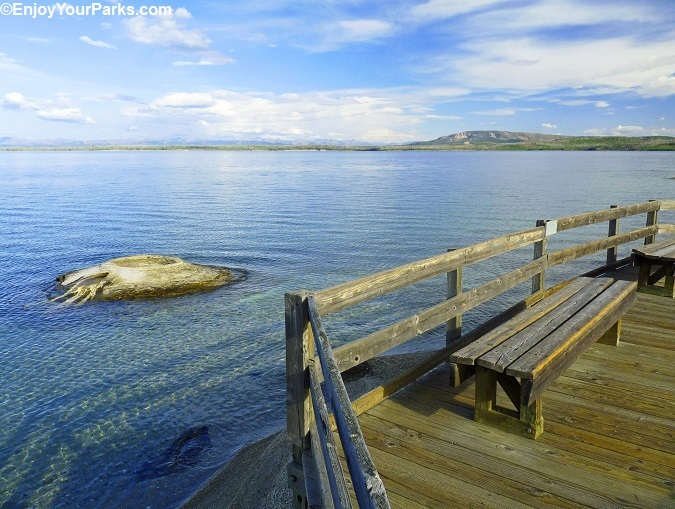 Located in the West Thumb of Yellowstone Lake in Yellowstone National Park lies one of our favorite geyser basins in the park. Found along the Grand Loop Road near West Thumb Junction, the West Thumb Geyser Basin rests on the shore of Yellowstone Lake, where some of the geysers are actually IN Yellowstone Lake! One of the most famous of these unique geysers is Fishing Cone Geyser, where in the good old days visitors would stand on the cone, and when they caught a fish, they would keep it on the line while lifting it out of the water and then dropping it into Fishing Cone Geyser. The fish would be cooked in the near boiling water of the geyser and would be ready to eat in just minutes! Of course this is not allowed anymore but is an awesome part of the history of this incredible area. The West Thumb Geyser Basin in Yellowstone National Park is very much worth taking the time to walk through along its boardwalks... it’s really remarkable and definitely belongs on our list of the top things to do in Yellowstone Park. 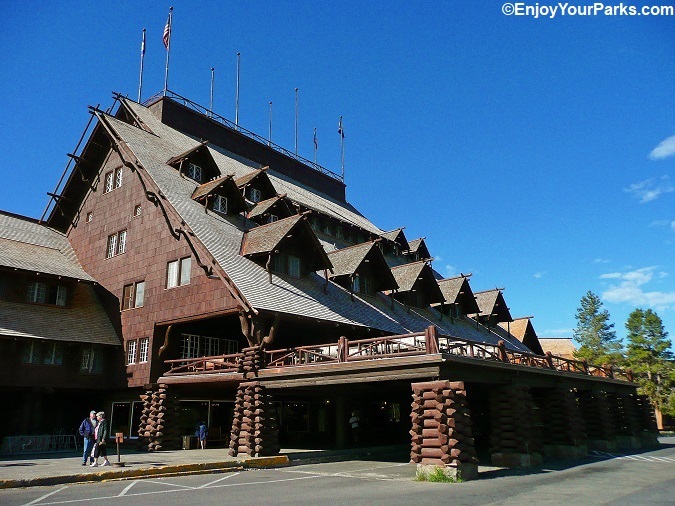 Old Faithful Inn is one of the Top Things To Do In Yellowstone Park. Old Faithful Geyser is one of the Top Things To Do In Yellowstone Park. Old Faithful Geyser and the Old Faithful Inn in Yellowstone National Park are not only among the most iconic attractions in Yellowstone Park, but are among some of the most recognized images in the world. Located in what’s known as “Old Faithful Area”, Old Faithful Geyser and Old Faithful Inn are at the very top of our list of top things to do in Yellowstone Park, and is really “the Heart of Yellowstone National Park”. Found along the Grand Loop Road between West Thumb Junction and Madison Junction, the Old Faithful Area includes Old Faithful Geyser, Old Faithful Inn, Upper Geyser Basin, Old Faithful Visitor Center, Old Faithful Snow Lodge and Old Faithful Lodge. Old Faithful Geyser is the most famous geyser on the planet, and is the top iconic feature of Yellowstone National Park. 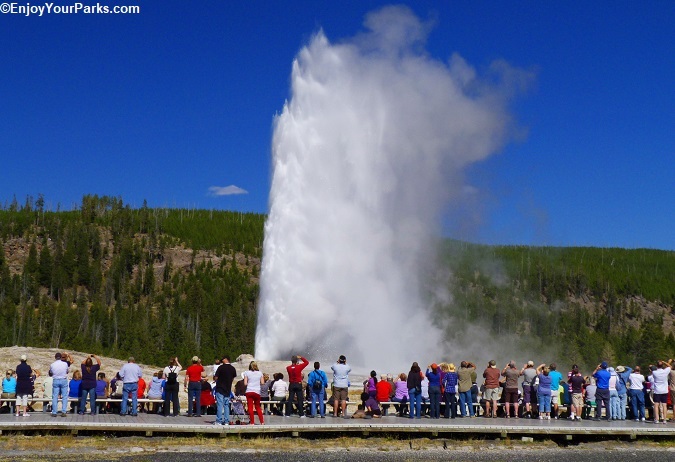 Reaching a maximum height of 185 feet, it is not the largest geyser in the world, or even in Yellowstone National Park, but it is one of the most predictable and most recognized... and most watched! Roughly every 90 minutes, Old Faithful Geyser erupts as thousands of visitors snap away with their cameras. No trip to Yellowstone Park would be complete without watching Old Faithful Geyser erupt. Seriously. Next to Old Faithful Geyser is the world famous Old Faithful Inn. Built during the winter of 1903-1904 and designed by 29 year old architect Robert Reamer, the Old Faithful Inn is the world’s largest log structure and is one of the most recognized and favorite buildings in America according to a survey conducted by the American Institute of Architects. The Old Faithful Inn is beloved world wide by visitors who have stood in its massive lobby, and once you do the same, and look up at this engineering marvel, you will join this world wide group of fans. The center of attention in the Old Faithful Inn lobby is the 85 feet high stone fireplace that weighs 500 tons! The Old Faithful Lodge is charming and magical no matter what time of day you visit it, but our favorite time to sit in one of its historic chairs or couches is at night, when the lighting becomes surreal and really shows of the “magic” of this enchanted hotel lobby. We can assure you that you will never forget and always cherish the first time you ever stepped foot in the Old Faithful Inn lobby, and you’ll most definitely come back throughout the years to re-visit it. Also located in the Old Faithful Area is the historic Old Faithful Lodge, the newer Old Faithful Snow Lodge, and Upper Geyser Basin which is home to some incredibly famous geysers such as Morning Glory Pool, Grotto Geyser, Grand Geyser and Riverside Geyser, just to name a few. There is a very nice paved walkway and boardwalks that take you through this remarkable geyser basin. Upper Geyser Basin is really a "must see" while visiting the Old Faithful Area of Yellowstone National Park. You’ll understand why we call the Old Faithful Geyser Area “The Heart of Yellowstone National Park” once you spend time exploring Old Faithful Geyser, Old Faithful Inn, Old Faithful Lodge and Upper Geyser Basin... it’s nothing short of magnificent and well deserving the top spot on our list of top things to do in Yellowstone Park. 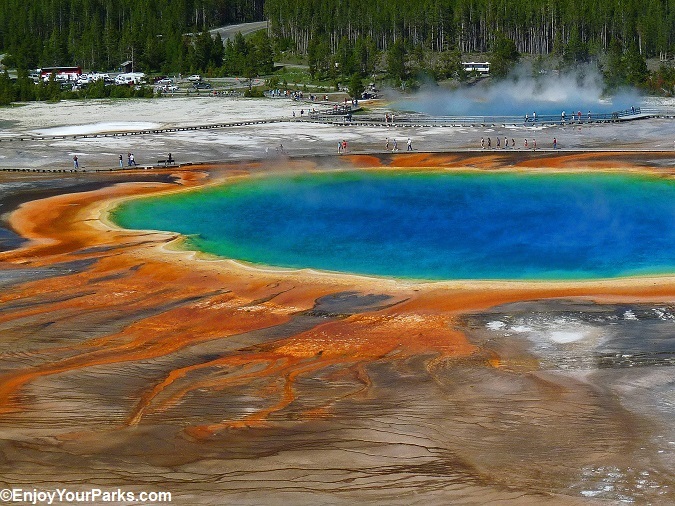 Grand Prismatic Spring in Geyser Row is one of the Top Things To Do In Yellowstone Park. Just north of Old Faithful Geyser and Old Faithful Inn along the Grand Loop Road begins a string of world famous geyser basins that are definitely on our list of the top things to do in Yellowstone Park. We call this area “Geyser Row” as there are hundreds and hundreds of geothermal wonders, all in a row along the Grand Loop Road, which includes (in order) Black Sand Geyser Basin, Biscuit Geyser Basin, Midway Geyser Basin and Lower Geyser Basin. Some of the world’s most famous geothermal features are found in Geyser Row, such as Grand Prismatic Spring, Emerald Geyser, Sapphire Geyser and Excelsior Geyser Crater, just to name a few. The Firehole River runs through it all, and is one of our favorite names for a river anywhere in the world. Yellowstone National Park has over 10,000 geothermal features, which is over half of all the geothermal features on the planet.... and a lot of them are found along Geyser Row: Black Sand Geyser Basin, Biscuit Geyser Basin, Midway Geyser Basin and Lower Geyser Basin. So take your time and enjoy the boardwalks that take to these amazing geysers... give it most of the day in our opinion... hopping from one basin to the next... and take it all in... its a world you’ve never experienced before. So without question, “Geyser Row” is among our top things to do in Yellowstone Park, and is one of the most remarkable destinations on the planet. CLICK HERE for more details on "Geyser Row"
The Madison Junction Area along the Grand Loop Road in Yellowstone National Park includes the confluence of the Firehole River and Madison River, Firehole River Drive and Madison Campground. An extension of the Madison Junction Area is the entire Madison Canyon, which takes visitors nearly all the way to the West Entrance at West Yellowstone Montana. Among our list of the top things to do in Yellowstone Park, the Madison Junction Area is personally for us one of our favorites because growing up as a child, David’s family would spend many a vacation camping at Madison Campground with their tiny Shasta Trailer house that somehow fit 5 kids and 2 parents... so lots of memories are here for David. And not only for David and his family, but to countless other families as Madison Campground is known as “America’s Campground”. The Madison River runs along this famous campground, where visitors and campers can enjoy fishing, swimming and inner tubing. The Madison Junction Area also marks the beginning of Madison Canyon, which heads straight west for about 8 miles as it works its way toward the West Entrance to Yellowstone Park at West Yellowstone Montana. This is an amazing drive and we highly recommend it if you have the time. There is not only terrific scenery, but also great wildlife viewing that includes elk, buffalo (bison), trumpeter swans, river otters and more... And West Yellowstone Montana is a blast to explore with its shops, restaurants and museums. 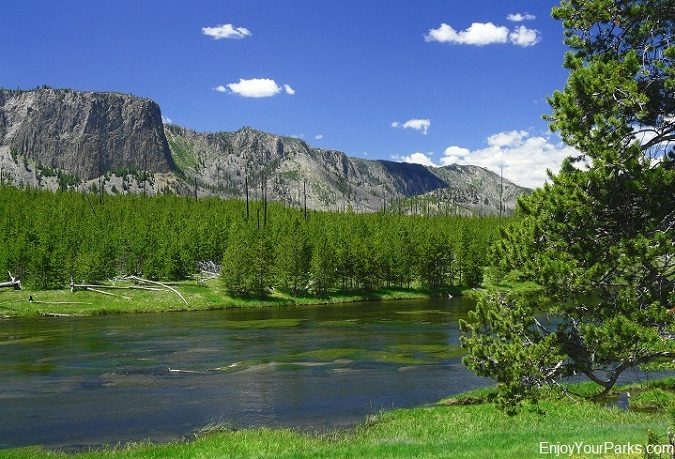 The Madison Junction Area,which includes Madison Campground, Madison River, Firehole River Drive and more, is a special place in Yellowstone National Park and easily qualifies to be on our list of top things to do in Yellowstone Park. Norris Geyser Basin is one of the Top Things To Do In Yellowstone Park. The Norris Area is located between Madison Junction and Mammoth Hot Springs in Yellowstone National Park, and includes Norris Geyser Basin, Gibbon Falls, Roaring Mountain, Artist’s Paint Pots, Nymph Lake, South Twin Lake and North Twin Lake, is the final attraction on our top things to do in Yellowstone Park as you drive along the Grand Loop Road, starting and ending at Mammoth Hot Springs near the North Entrance to Yellowstone National Park. The main attraction in the Norris Area of Yellowstone Park is Norris Geyser Basin. Norris Geyser Basin is a large, diverse Yellowstone Park geyser basin that is home to the tallest active geyser in the world: Steamboat Geyser. Steamboat Geyser reaches over 300 feet in the air when it erupts, which may be years between eruptions. However 2018 was an extremely active year with multiple eruptions, the last one before writing this page was on October 15, 2018. There are several miles of boardwalks that take visitors through the massive Norris Geyser Basin, and it takes several hours to see and enjoy it all. 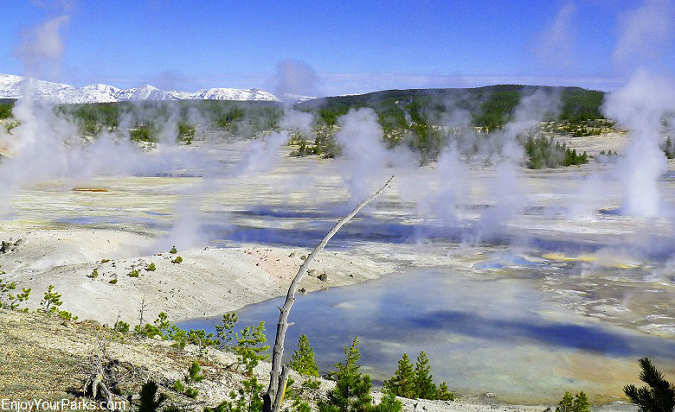 An interesting fact about Norris Geyser Basin is that it’s the hottest place in Yellowstone National Park. Most of the geysers are at least 199 degrees F, and just below the surface of Norris Geyser Basin scientists found the hottest temperature in Yellowstone Park at 459 F! In addition to the amazing Norris Geyser Basin in Yellowstone Park, that includes Steamboat Geyser, along the section of the Grand Loop Road between Madison Junction and Mammoth Hot Springs known as the Norris Road, visitors drive by other major attractions such as Gibbon Falls along the Gibbon River, Roaring Mountain Area, Artist’s Paint Pots, Nymph Lake, South Twin Lake and North Twin Lake. This entire Norris Road Area is fascinating and also is home to a lot of wildlife... especially during the spring of the year as elk like to calve in this area. That means grizzly bears and wolves like this area too. So without question, the Norris Area in Yellowstone National Park is a big part of our list of top things to do in Yellowstone Park, and is the final top Yellowstone Attraction along the Grand Loop Road as you start and end your journey at Mammoth Hot Springs. (Note: you will also pass through Swan Lake Flat just before you once again reach Mammoth Hot Springs, which is a top attraction that we talked about at the start of this page when we discussed the Mammoth Hot Springs Area.